Enjoy home-grown summer flavor all year by learning how to dry herbs! Find various methods and helpful tips for how to dry fresh herbs, and how to make a fragrant fire starter after drying fresh herbs. Discard any damaged leaves. Strip large-leaved herbs, such as sage and mint, from their stalks. But leave small, feathery herbs, like dill and fennel, on the stalks until drying is complete. Tarragon, bay, mint, lemon balm, lavender, rosemary and small-leaved herbs such as thyme take well to air-drying, so they are great for beginners. If you live in a humid area, the process may be slower, and mold can be a problem. If mold is an issue, we recommend using a small commercial dehydrator. Hang the bunches up to dry, leaves downward, wrapped loosely in muslin or thin paper bags to keep out dust and to catch falling leaves or seeds. Do not use plastic bags because of mold development. Allow seven to 10 days to dry, depending on the size of the branches and humidity. They’re completely dry if the leaves sound like crisp cornflakes when crushed. You also can air-dry the seeds of herbs such as fennel, parsley, caraway and coriander. Seed heads tend to ripen unevenly, so once most of a head is brown, harvest it with about 2 feet of stem (or as long a stem as possible). Bundle four to five stems together, then cover the heads with muslin or a paper bag and hang them upside down. You can speed up drying by spacing out individual sprigs or leaves of herbs on racks. To make a drying rack, stretch muslin, cheesecloth or netting over a wooden frame and fix it in place. Place the tray in an airing cupboard, in the warming drawer of an oven or in a warm, airy spot out of direct sunlight. Turn leaves frequently to ensure even drying, which should take two or three days. The leaves of herbs such as sage, mint, rosemary, thyme and parsley, stripped from their stalks, are well suited to oven drying. Space out leaves on a muslin-covered tray in an oven set to the lowest possible temperature. Higher temperatures diminish the fragrant essential oils. Leave the door ajar to allow moisture to escape. Microwaving works well when drying small quantities of herbs. Separate the leaves from the stems, rinse if necessary and let air dry. Place a single layer of leaves on a paper towel on a microwave-safe plate. Lay another paper towel on top, and microwave on high for 1 minute. Watch closely, and stop if you smell the herbs burning. Continue heating at 30 second intervals, if needed, until the herbs are fully dry. Use this process for all drying methods. Crumble the dried herbs with your fingers (discard the hard leafstalks and midribs) and store in small, airtight containers. Dried herbs are suitable for cooked foods, but remember: Drying concentrates the flavors, so you don’t need to use as much in recipes. For example, if a recipe calls for 1 tablespoon of fresh herbs, use 1 teaspoon of dried herbs instead. Timing is everything: Harvest herbs in the morning after the dew has dried from the leaves. Try to harvest herbs for drying before flowers develop for better flavor. To make an aromatic herb fire starter, gather old newspaper and an assortment of herbs. Sage, basil and rosemary work well; experiment with your favorites. 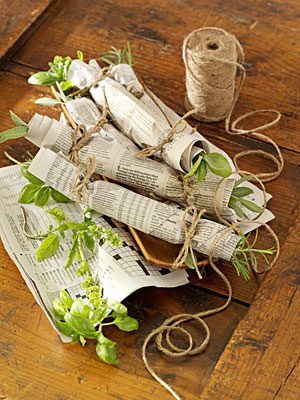 Wrap the herbs in a sheet of newspaper and secure the ends with raffia or cotton twine. As you pile the logs, tuck a few of the herb bundles underneath, allowing the newspaper ends to stick out. Then light the paper ends to start the fire. As the paper burns, the herbs will catch fire, igniting the logs and sending a lovely aroma through the air.